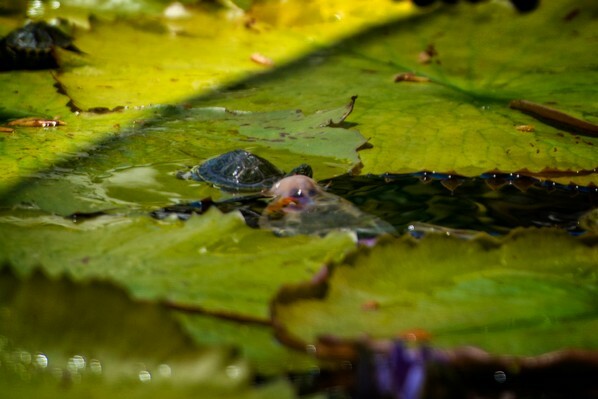 Frowning Turtle - the notWildlife Blog - A collection of high quality backyard wildlife photos. A collection of high quality backyard wildlife photos. It’s no wonder he frowns... Imagine that every time you take a bite of food, you have to go under water to swallow it. Such is the life of the red-ear slider. This presents a problem while feeding as there are monster koi in the same waters. These monster koi are constantly eating anything they can fit in their mouths. It borders on annoying for me, but I can’t even imagine how the turtles must feel about it. In the photo below, I watched this little guy grab piece of food and head to the water to swallow it. Each time he was met by a different fish trying to swallow his head or at least trying to steal his meal. This seems to take place no matter what or how much I feed the koi in advance or at the same time. Greed alone serves as the likely explanation.